Edinburgh has a unique claim to fame in being the world’s first UNESCO City of Literature, a permanent award in recognition of its outstanding literary credentials. This blog series will profile the people, places, and events that entitle Edinburgh to this prestigious accreditation. Below is part 1 of the series, covering the city’s eminent writers. New profiles will be added regularly, with additions announced on our Facebook page. 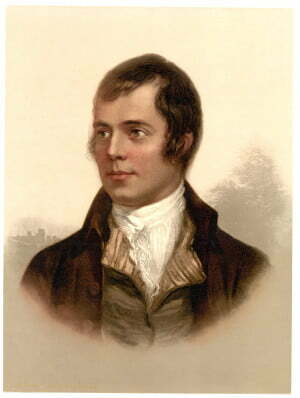 Robert Burns (1759 – 1796), also known by a host of other monikers including Robbie Burns and Rabbie Burns, is Scotland’s national poet, an unofficial accolade signifying his iconic status and his definitive expression of Scottish cultural identity. Burns’s use of Scots language and Scots dialect, as well as his collation and adaptation of folk songs from across Scotland, were instrumental in this. Burns has had an enduring influence on Scottish literature, and his national importance is such that his birthday, on 25th January, is an annual celebration, involving recitations of his poetry and preparation of Burns suppers (a meal of haggis, neeps and tatties). His poem and song, “Auld Lang Syne”, is traditionally sung at Hogmanay, our national New Year celebration. Burns arrived in Edinburgh in 1786, beginning a fruitful period of his life that saw him embraced by the city’s aristocracy and produce prodigious volumes of song and poetry, as well as a number of illegitimate children from his numerous affairs. His unbridled lifestyle was probably one of the factors contributing to his premature death, at age 37, while working as an Excise Officer in Dumfries. 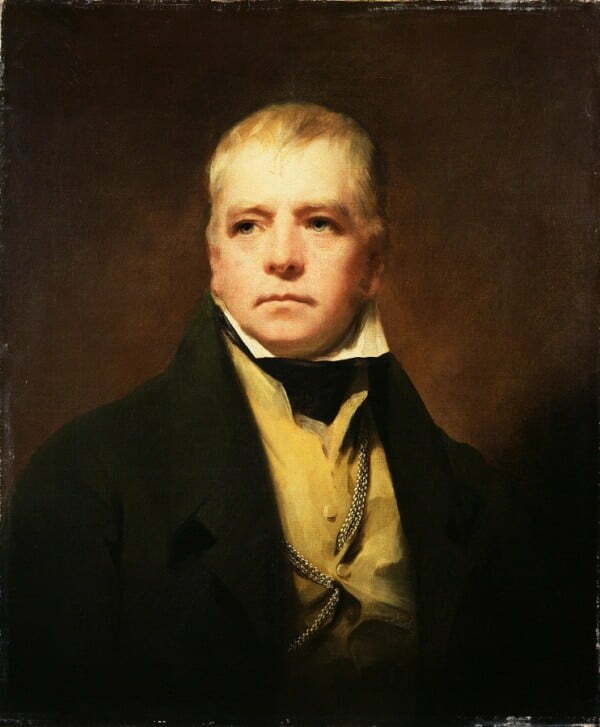 Sir Walter Scott (1771 – 1832) is widely credited as the originator of the modern historical novel, and was also a distinguished playwright and poet. He combined his literary pursuits with a long legal career, political engagement, and membership of several societies, including a prolonged presidency (1820 – 32) of the Royal Society of Edinburgh, an educational charity spanning a wide range of disciplines. Born in Edinburgh’s College Wynd (now Guthrie Street), Scott spent most of his youth between Edinburgh and Roxburghshire. His first success as a writer was as a poet, inspired by the time he spent in his youth in the Scottish Borders, where he collected Border Ballads. He enrolled at the age of 12 to study Classics at The University of Edinburgh. In 1787, a 15-year-old Scott met Robert Burns (see above) in the home of his friend, Adam Ferguson, and remembered the encounter particularly for Burns’s striking brown eyes. Scott married Charlotte Charpentier in 1797, with whom he enjoyed a long and happy marriage, and lived with her at 50 George Street, Edinburgh. Scott’s first son, Walter, was born in 1801, and the following year his family moved into a three-story house at 39 North Castle Street, where they lived until 1826. This was the period in which he established his international literary reputation, his first major success being The Lay of the Last Minstrel (1805), which saw stellar sales (approximately 44,000) for a work of poetry. It also had a proportionate effect on the Scottish tourism industry, drawing crowds to Melrose Abbey, the moonlit splendour of which he described in the work (although he later admitted to never having seen the abbey by moonlight himself). This success was surpassed by Marmion (1808), his next major work, concerning Scotland’s biggest military defeat at the battle of Flodden Field in 1513. We’re delighted to have The Scott Apartment among our portfolio of properties available for guests to rent. This superbly situated apartment was once the garden level of Scott’s fashionable North Castle Street abode, and can accommodate up to six people. It was among the most coveted residences of his time, and is equally desirable today, having been modernized for the new millennium. In 1809, Scott holidayed at Loch Katrine and drew on this experience in writing The Lady of the Lake (1810), exploring King James V’s dealings with the Douglas clan. It cemented his fame by again breaking all poetry sales records, and bolstering the loch’s popularity as a tourist hotspot. Scott’s influence is still in evidence today in the loch’s 1900 steamship, Sir Walter Scott, and a cruiser, Lady of the Lake. He completed his first novel, Waverley (1814), from an abandoned manuscript (although he only admitted to its authorship in 1827). With its innovative blend of history and fiction, the work is today recognized as the forerunner of the modern historical novel, with its protagonist, Edward Waverley, embroiled in the 1745 Jacobite rebellion which sought to restore the Stuarts to the throne. On the year of the book’s publication, it sold more copies than all the other novels published in the UK put together. In February 1818, Scott discovered the lost Crown Jewels, or “Honours of Scotland”, after being granted permission to search Edinburgh Castle by the Prince Regent. The Honours are now on display to visitors there. With Ivanhoe (1820), Scott extended his audience and furnished his readers with enduring images of 12th-century England. In 1822, he organized King George IV’s reception in Scotland, the first visit by a British monarch for over a century. He had a hand in the design of the clan tartans worn by Highland chieftains summoned to the capital for the occasion, in demonstration of their loyalty to the king, and which formed the basis of today’s tartans. The visit included a performance of Scott’s Rob Roy by the Royal Command, and a grand ball at the Assembly Rooms which saw the Highland kilt adopted as Scotland’s national dress. This is one profound example of Scott’s facilitation of a more holistic national identity, evident in his work to unite Highlanders and Lowlanders, as the kilt — now a Scottish national icon — was hitherto shunned by Lowlanders. After a financial crash wracked his publishers and printers in 1825, Scott found himself mired in an astounding £121,000 of debt. His Borders estate, Cartley Hole Farm, which Scott had acquired in 1811 as the site of his grand home, Abbotsford, had been settled on his son earlier that year, but Scott was forced to sell his Edinburgh home and its contents, and shirked Castle Street for the rest of his life. His fortunes took further falls when he suffered a partial stroke, and in 1826 his wife died, but despite these calamities, Scott resolved to settle his debts without recourse to the proffered help of his friends. He embarked on his most productive period of writing, a precursor to his declining health (which included the sufferance of a full-blown stroke and expressions of sympathy from the Royal Family), and eventual death, in his Abbotsford home, aged 61. By this time, Scott had reduced his debt by over a half, and it was cleared in full some 15 years later following the sale of his copyrights. He was buried in Dryburgh Abbey in a ceremony of stately significance. Joanne Rowling’s pseudonym, J.K. Rowling, is synonymous across the world with her Harry Potter novels, the best-selling book series of all time. Born in Yate (Gloucestershire, England) on 31 July 1965, Rowling began writing fantasy as a child, reading her stories to her younger sister, Dianne. She experienced two childhood moves, residing in Tutshill while she completed her secondary education at Wyedean School, where she was deemed Head Girl. Rowling enrolled at the University of Exeter and attained a Joint Honours in French and Classics before moving to London to work as a bilingual secretary for Amnesty International, and then on to Manchester at the Chamber of Commerce. She has related how her Harry Potter series germinated while she was on a delayed train between the two cities, and her destination on that day, London’s King’s Cross Station, now bears a mock Platform 9 ¾ in homage to the one she conceived in the books as the gateway to her wizarding world. Rowling’s adult life to-date would appear to be one of diametric extremes, beginning with loss, failure, deprivation, and prolonged struggle, and culminating in unprecedented success. The bleak era of her life involved the death of her mother from multiple sclerosis, after which Rowling moved to Portugal to teach English as a foreign language by night, while writing during the day. Here, she met her first husband, Jorge Arantes, with whom she suffered a miscarriage before giving birth to their first child, Jessica Isabel Rowling Arantes (named after Rowling’s childhood hero, Jessica Mitford). The marriage deteriorated and Rowling came to Edinburgh in December 1993, accompanied by her daughter and the opening chapters of Harry Potter. During this time, she endured the darkest spell of her life: clinical depression, suicidal thoughts, and abject poverty (she subsisted on welfare). When her husband followed her to Scotland, she took out a restraining order, and filed for divorce shortly thereafter. In August 1995, Rowling undertook a teacher training course at Edinburgh University’s Moray House School of Education. In the same year, she completed her first manuscript, Harry Potter and the Philosopher’s Stone, writing in various cafes, including Nicolson’s Café (now Spoon Café) and The Elephant House. It was not an immediate breakthrough; though she gained representation from Christopher Little Literary Agents, her manuscript was rejected by all 12 of the publishing houses to which it was submitted. Another year passed before Bloomsbury decided to publish it, and Rowling was only able to continue writing with the help of a grant from the Scottish Arts Council. The book’s publication in 1997 marked the beginning of the positive era of her life, and it garnered several awards. The following year, Scholastic Inc. made a successful bid of over one-hundred-thousand dollars for the novel’s US publication rights, retitling it Harry Potter and the Sorcerer’s Stone, and thus Rowling gained her first taste of financial security. Subsequent entries in the series, foremost being Harry Potter and the Chamber of Secrets (1998), continued the trend of commercial and critical success. With Harry Potter and the Prisoner of Azkaban (1999), Rowling became the first person to win the Nestlé Smarties Book Prize three consecutive times. She withdrew the fourth instalment in the series, Harry Potter and the Goblet of Fire (2000), from contention to allow other books recognition. In 2000, Prisoner of Azkaban went on to win the Whitbread Children’s Book of the Year award, and Rowling was named Author of the Year at the British Book Awards. Harry Potter and the Half-Blood Prince (2005) garnered the 2006 Book of the Year prize. The final four books in the series, which include Harry Potter and the Order of the Phoenix (2003) in fifth place and Harry Potter and the Deathly Hallows (2007) at the end, have consistently set records as the fastest-selling books of all time. Rowling has also written three additional volumes set in the Harry Potter universe, Fantastic Beasts and Where to Find Them (2001), Quidditch Through The Ages (2001) (both titles of Harry’s school books in the mainstream series), and The Tales of Beedle the Bard (2008), all of which were published for charity. Rowling is currently writing the screenplay for Fantastic Beasts as the inception of a new film series with Warner Bros.
Rowling’s first novel after the Harry Potter series was The Casual Vacancy, published in April 2012 and subsequently adapted as a BBC television drama series. By 2013, she fulfilled her longstanding aspiration to write crime fiction, publishing The Cuckoo’s Calling, the inaugural novel of a new detective series, Cormoran Strike. The novel was published under the pseudonym Robert Galbraith, but within a few months, Rowling was exposed as its author, resulting in 40-fold spike in sales. Its sequel, The Silkworm, was released in June 2014, and will be followed in October 2015 by Career of Evil. J.K. Rowling lives in Edinburgh with her family. Scotland: A Literary Nation, pamphlet produced by The Edinburgh UNESCO City of Literature Trust.